Sunsets are a constant in my pursuit of photography. Anytime I find myself in a new place, I make it a point to capture the sun at its loveliest hour. And if you've been following some of our great photographers, they would tell you that the best time to take photographs are Sunrise and Sunset. Cliche as it may sound, but that's just the way it is. Here is a view of sunset from the lovely La Vista el Mar Resort in Upper Calarian, Zamboanga, the city where I lived and grew up in, and which holds so many of my fond and sentimental memories, including meeting the man of my dreams who would become my husband. 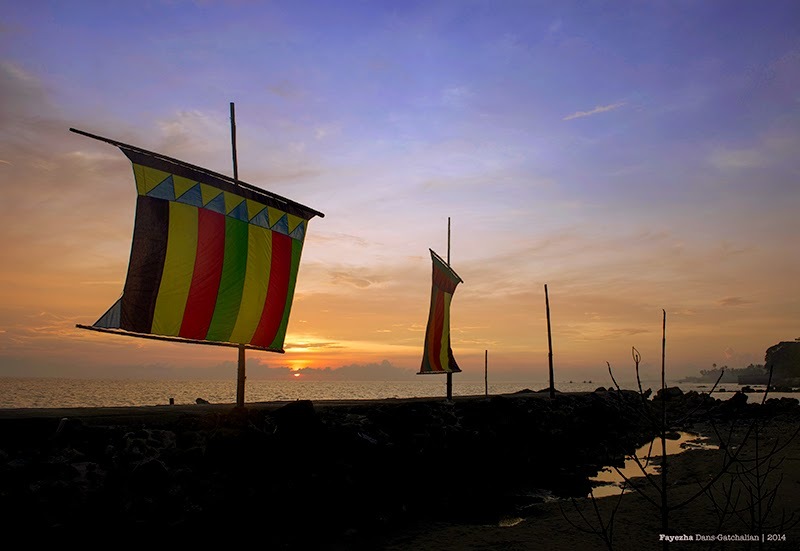 At the foreground are vintas, traditional colorful sails, which were used by the Sama-Badjao and Moro inhabitants of Mindanao for transport, migration and engaging in inter-island commerce. They are an integral part of our history and, to this day, are still in use and a regular staple along the boulevard. In celebration of our city’s rich and unique cultural history, the annual Regatta, a race of wonderful and prismatic vintas, is held every October during Fiesta Pilar to the delight of thrilled fans and spectators. This is the best time to visit our city. Have you ever been to our City yet? It is only an hour and a half plane ride from Manila. Why not come for a visit and be awed by one of the most romantic sunsets you could ever see. You can check Cebu Pacific and Philippine Airlines for promo fares. Our city also has a lot of Hotels you can choose from, e.g. Garden Orchid Hotel, Lantaka By the Sea, Marcian Garden and a lot more. If you are in the City, delight yourself in the most popular restaurant Alavar's and try the very delicious Curacha in alavar sauce. Share me your thoughts by commenting below. Muchas Gracias!